I am revinewing the latest of Sony’s VAIO E Series laptops which is the latest in Sony’s mainstream laptops for the new computing lifestyle. As for an entertainment-focused company, these computers are typically optimised for “entertainment” read multimedia use rather than just as a laptop for doing homework on. Although Sony is running some 14” models in the VAIO E Series lineup, I am deliberately focusing the review on the 15” models which appeal to the mainstream user base. It is the current iteration of the E Series “entertainment laptop” computers, a few examples of which I have reviewed before. Like most laptops targeted at this market, the VAIO is a regular clamshell laptop without any convertible functionality or extra screen. It doesn’t even have a touchscreen which is something I would like to see appear in this class of laptop. There is a variant in this series (Model: SVE15137CG) with the same screen size that is AUD$400 cheaper but comes with the Intel i5 CPU that may suit mainstream users who don’t chase the ultimate performance from the processor. Other than that, it has the same display, storage and connectivity specifications as this model that I am reviewing. 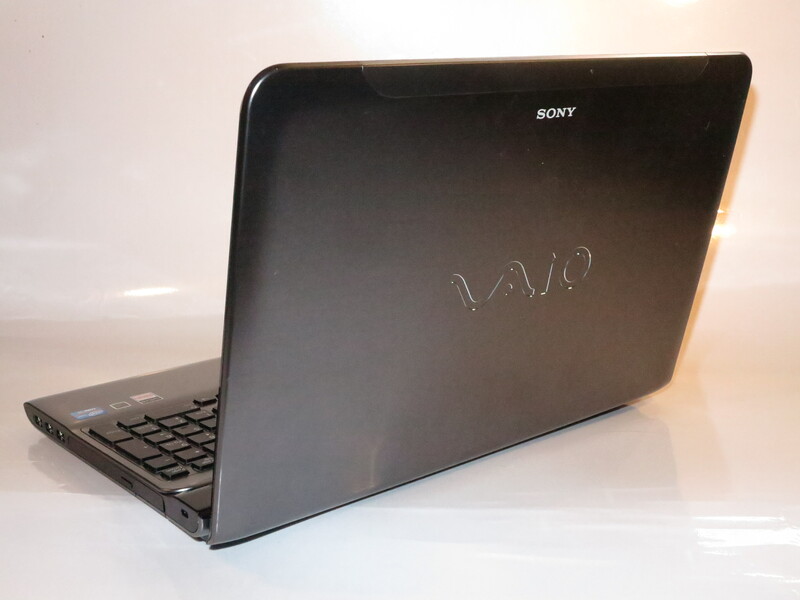 The VAIO E Series computer is very durable even though I am using a sample model. There is an increased amount of plastic used on the body rather than the a metal-finish palmrest. The metal finish is used mainly on the lid. When I review laptops, I pay attention to the temperature control issues during use and notice any heat buildup or overheating that can occur. Here, I noticed some hat coming out of the vent on the left hand side of the laptop during video playback. This means that it can keep its cool with no need to run the fan, yet it calms down a few minutes after video playback. This is something to be expected for the larger laptops. 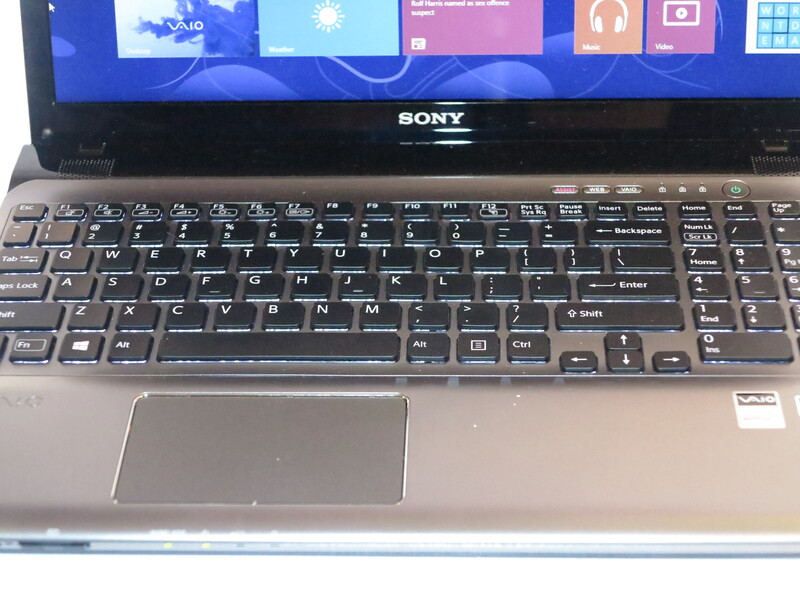 The VAIO E Series is equipped with an illuminated keyboard that is easy to type on especially if you are touch-typing. 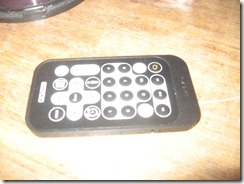 There is also the full numeric keypad which can come in handy when you do business work. The trackpad doesn’t jump around as easily when typing but feels a bit loose although I am reviewing a pre-issue computer. As far as the switches go, there are the usual power, Web-direct and assist-direct buttons but this laptop doesn’t have buttons for direct access to “flight-mode” Wi-Fi and Bluetooth on/off or volume controls, which I would find as being of use with any laptop. 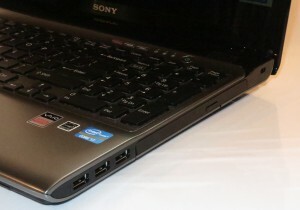 The AMD video graphics subsystem in the Sony VAIO E-Series laptop provided me with a smooth graphics experience even for online video. Personally, I would like to have the option to make the VAIO run on a battery-conserve mode with use of integrated graphics for when you use it on the road. 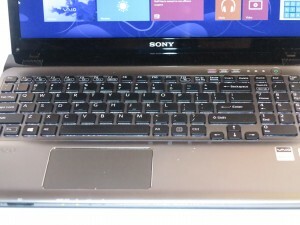 Like a lot of consumer laptops, the VAIO has that same glossy screen which may cause problems in some usage environments. As for the sound reproduction, the integrated speakers do sound thin even though there is the sound-tuning that Sony provides. This would be good enough for speech-driven applications like Skype but I would find that headphones or external speakers work better if you want better sound. There is one USB 3.0 connector with the Sleep and Charge option for use with charging your phone or tablet while the system is in sleep mode. But the other USB connections are USB 2.0 which would suit most non-storage devices. Personally I would rather that all the USB ports are USB 3.0 types. Other than that, there is a good complement of connectors on the VAIO E-Series laptop. This includes an HDMI connection for modern flat-panel displays, a VGA display for economy data projectors as well as separate microphone and headphone sockets for audio connection. For network connectivity, this computer can work with a Gigabit Ethernet segment or a 2.4GHz g/n Wi-Fi wireless segment. Personally I would like to see this be equipped with a dual-band Wi-Fi network adaptor to take advantage of higher-throughput less-occupied 5.4GHx wireless networks. There is also support for Bluetooth 4.0 which makes it work with power-conserving Bluetooth Smart sensor peripherals. There is a 750Gb hard disk but it has some of the space taken up by the system recovery partition. As well, it has an integrated DVD burner, a feature that still has some relevance but is likely to disappear especially with slimmer laptops. Like other Sony laptops, there is a separate MemoryStick slot as well as the SD card slot for removable data storage options. The battery runtime was OK for day-to-day use but if you were watching multimedia content, it ran out quickly. I noticed that the battery was half-empty after watching the on-demand video and I .could get 2 hours from a DVD movie. The problem could be easily mitigated through allowing the user to run with integrated graphics when the laptop is running on battery. But on the other hand, this may not be an issue when the VAIO is used as a work-home laptop computer and ran mainly on AC power. 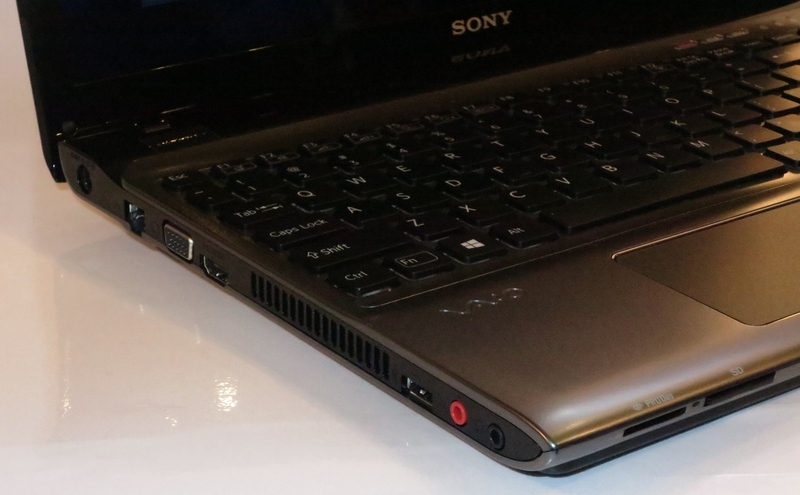 Here, we need to see the arrival of touchscreens for the 15”-17” class of laptops in order for Windows 8 to be relevant to this class, as I have noticed before when I reviewed the Toshiba Satellite P870 and as I notice with this VAIO laptop. Sony could offer a premium 15” variant for the VAIO E Series with a 1Tb hard disk, along with a BD-ROM / DVD burner optical drive, 8Gb RAM as well as dual-band Wi-Fi. Here, this could work as a deal maker for those of us who want a 15” laptop that has all the fruit. I would recommend the current 15” Sony VAIO E-Series laptops more as a laptop to take between work and home or use as a regular household laptop. 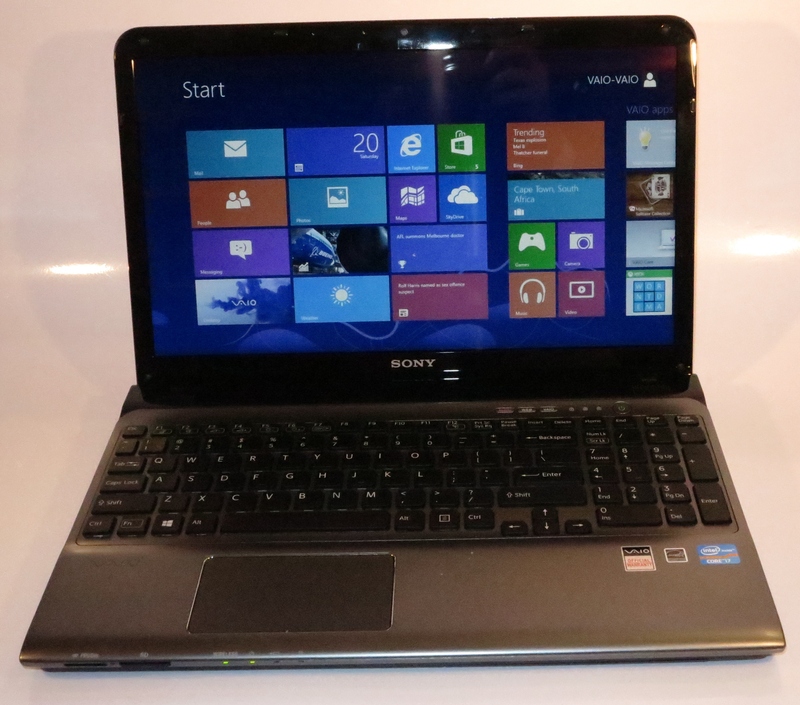 This is especially if multimedia and gaming is a key function that you chase and you value the Sony VAIO brand. If you needed to save a bit of money, you could go for the cheaper variant that I have mentioned in this review.